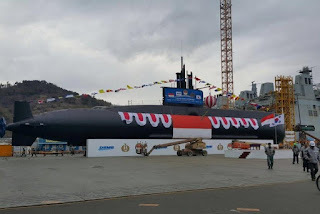 JAKARTA, -- After waiting three years, Indonesia will soon have new submarines, as three submarines purchased from South Korea are expected to be completed soon. Defense Minister Ryamizard Ryacudu and Navy chief of staff Admiral Ade Supandi visited South Korea to witness the unveiling of the submarines. “The unveiling was only ceremonial in nature, [it is important] for the Navy as the user to see that the product is ready,” Ade Supandi said in South Korea on Wednesday. He said that after the unveiling, the producer would finish up the necessary tools so that they could be delivered and commissioned. It was reported that the ministry and Daewoo Shipbuilding Marine Engineering (DSME) signed the contract for the three Chang Bogo-class submarines in 2011. The contract was worth US$1.07 billion. Under the contract, two submarines would be built in South Korea in cooperation with state-owned shipbuilder PT PAL, while the third submarine would be built at PAL’s facilities in Surabaya. Besides submarines, Indonesia expects other new weapons to arrive in 2016-2017. According to the chief of the ministry’s procurement center, Rear Admiral Leonardi, the weapons are leopard tanks, F-16 jet fighters and frigates. They will arrive gradually. The Indonesian Navy Improved Chang Bogo-class submarine KRI Nagabanda (403) handover ceremony in Seoul.